Welcome to the Meet Fishing Kid page. 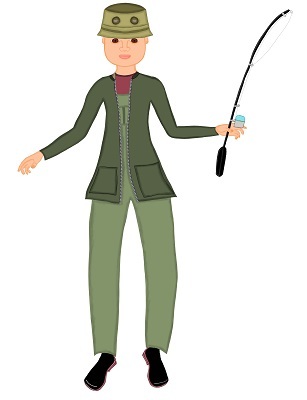 Fishing Kid is a character I created in 2005 as part of my Canadian Family stories. I traveled through New Brunswick which is where I have Fishing kid based. Even though I have never actually seen a large fishing boat up close, I grew up with fishing in my blood. I remember as a young girl, my grandfather would take us fishing at his cottage in Bobcaygeon, Ontario. We would either fish from his dock or fish from his motor boat. It was always an enjoyable part of my life and one that I miss dearly. I remember Grandpa catching fresh pickerel and Grandma cooking it up for us for breakfast. I remember how good it tasted. It is with those memories that my Fishing Kid character exists. This entry was posted in Canadian Family Stories, Fishing Kid Stories, Meet the Characters and tagged Bobcaygeon, breakfast, Fishing Kid, Grandma, Meet Fishing Kid, Ontario. Bookmark the permalink.